Jun’ya Ota was 19 when he decided he wanted to make a game. Unsatisfied with most games on the market, he wanted to make something for himself to enjoy: something simple, challenging and a bit oddball. In his spare time, he taught himself programming and how to compose game music. Under the alias ‘ZUN’, Ota created Touhou Rei’iden—Highly Responsive to Prayers in 1995. In a game vaguely similar to Breakout, Shinto monk Reimu Hakurei smacks around a giant yin yang ball as she crosses dimensions, searching for the demon who destroyed her shrine. It’s absurd, difficult to control, and unrepresentative of the series as a whole. While the yin yang ball mechanic was thankfully dropped, the game’s bosses were clearly influential. Most stages involved flipping tiles and scoring points, but every five levels, Reimu would encounter a vaguely hellish figure. These unnerving enemies would shower the screen in increasingly complex patterns of projectiles, shifting the focus from coping with a primitive physics engine to simple survival—a welcome change of pace. The Story of Eastern Wonderland was ZUN’s second game, and a significant departure. 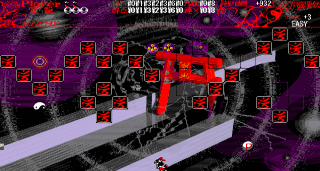 It was the first ‘true’ Touhou game, a bullet hell shoot-’em-up with slower, more intricate patterns of projectiles. However, ZUN was still experimenting with the tone and setting of the Touhou series: in one tonally confused level, after fighting hordes of cartoonish ghosts, you encounter a modern-day tank emblazoned with a yin yang symbol. Computers at the time weren’t well equipped for rendering action-oriented games. The first five Touhou games were developed on the NEC PC-9801 (‘PC- 98’), a Japanese MS-DOS-based computer roughly analogous to the Apple II. Due to the low framerate, resolution and colour spectrum, half the challenge was telling enemies’ projectiles from the background. The music was similarly difficult to appreciate, due to the small range of noises the computer could make. Though ZUN finished Highly Responsive to Prayers in 1996, he initially sold the first two Touhou games a year later at Comiket 52, a biannual convention and market for self-published works. Sales of the first five games were unremarkable: 1998’s Lotus Land Story sold less than 300 copies. Mystic Square marked the fifth and final release of the PC-98-era titles, and after the series’s tepid reception, it seemed to be the end of the Touhou Project—an eccentric curiosity that never broke out of obscurity. ZUN went on to work for Taito Corporation as a programmer for several years. A competitive multiplayer twist on the classic bullet hell action. Dodge bullets and send some over to your opponent. Take a spin as the supernatural paparazzi. Snap photos of bosses and their bullets. Like Pokémon Snap in hell. The third collaboration with Twilight Frontier. A projectile-heavy beat-’em-up where magical girls attack each other. Fan favourite Cirno is at war with the other fairies. Freeze bullets and marvel at how ludicrous the series’s numbering has become. In 2002, ZUN’s blog carried an announcement: a new game, The Embodiment of Scarlet Devil, was in development. This sixth entry was hardly recognisable as a descendant of his earlier works. Running on Windows, it was fast and fluid – the equivalent of moving from Wolfenstein 3D to Quake. It was a fresh start for the Touhou series, and a rebellion against the direction he saw other games going in. ZUN felt many shmups at the time were overburdened with abstract systems and gimmicks, leaving dodging projectiles as an afterthought. In a brief post-mortem, ZUN wrote, “The Embodiment of Scarlet Devil brings things back to the starting point, by curbing the game systems that change the difficulty in obscure ways while at the same time pursuing the natural fun of dodging bullets.” It was slow to build momentum – initial circulation was limited to the copies sold at conventions, and later, online CD retailers. Ultimately, the three things that garnered the most attention for the Touhou Project were the music, the characters, and piracy. As a self-taught composer, ZUN’s early compositions were largely forgettable, unaided by the crude chiptune system he had to work with. After years of experience and the technological leap, he was able to make something special. TEoSD’s memorable, orchestral soundtrack was, like many aspects of the series, atypical for the genre, but nearly every song made the best of its synthesized pianos, strings, and horns. Future releases maintained that standard of quality, and as fans began to put out cover albums, people became familiar with Touhou’s music before the games themselves. As a self-taught artist, however, ZUN’s work has been less successful. Trying to make the characters cute, many came out disproportioned and doughy-faced. The dialogue is also laughably baffling, including such biting insults as, “She’s lower than a human. I bet she doesn’t even have ten fingers.” What ZUN did establish was distinct personalities, however one-dimensional. As the cast expanded, fan works became increasingly widespread, including art, writing and games. While the Touhou Project’s popularity was growing steadily, distribution of the games wasn’t. Initially, circulation was limited to copies from Comiket. A few online hobby shops began to stock copies, some of which shipped internationally. Availability though was frequently limited, and many people interested in the series turned to piracy. This, combined with fan translations, led to an international fanbase. After the release of the seventh game, all the excitement culminated in 2004 at the first Annual Hakurei Shrine Grand Festival, a convention exclusively for Touhou fans. ZUN used the opportunity to demo both Imperishable Night, the eighth entry in the series, and Immaterial and Missing Power, a fighting game made in collaboration with Twilight Frontier, a Japanese indie developer group. The convention has grown each year since, offering the perfect platform for popular cover bands to release albums. Ten conventions and 13 games later, ZUN is married, has a child, and Touhou has blossomed into one of the most popular Japanese indie game series. He has no intention of stopping: “I’m going to keep making games that stand out. If all my fans disappear, I’m still happy if I can keep doing the games I want."